Demonloard Horaxona meets Alice the Black, the insane berserker of Sorgath. Alice tells Whoraxona "You hit like a limp limbed, drunk goblin". 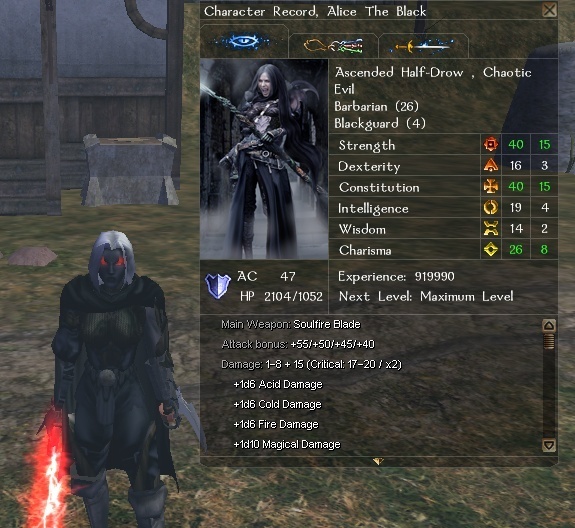 (oddly enough though... while Horaxona cannot damage Alice at all, the Nemesis can do up to 18 per hit, which is nothing with Alice's 1,000+ HP.... the Dark Reavers are actually a big threat to her still, and the three at the end of the gauntlet can beat her down pretty fast if she doesn't keep up on the asis full heals). If you see Alice uncorking a self-sacrifice potion, run. Just run, keep running, and don't look back. It's a nice result, so I hate to spoil your bubble, but self sacrifice is subject to spell resistance. Nice sword, is it an evil version of soulfire warrior's or a custom one? And yes, evil soulfire warrior blade. Evil SFWs get red gear, neutral gets green gear, and good gets the blue gear. The soulfire blade appearance isn't available for customs. There's the 'jedi sword' appearance out of the CEP that's available but it's far lower quality, and is more 'solid' looking than flamey-fiery looking. Didn't realize you wanted to brag about the coolness factor of wiping out a group of orcs by making yourself DEAD. But seriously, what is the toughest creature without SR? Barbed demons and mariliths, don't think they have SR and if they do it's extremely low. If one went full barbarian (or barbarian + d12hp classes), maxed out their con as much as possible, they could have 1760 HP.... 3520 with the amulet of abundant life.... which is... insane.